In 2005, ODPHP and ASPE determined it was necessary to investigate the extent to which coordinated efforts to achieve Federal health promotion and disease prevention goals had occurred. They contracted with the National Opinion Research Center (NORC) to conduct an assessment of how the Healthy People 2010 and HealthierUS initiatives were being used by state, local and tribal health organizations/agencies. 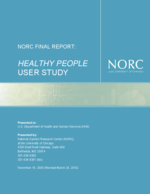 NORC’s Assessment of the Uses and Users of HealthierUS1 and Healthy People 2010 (2005 User Assessment) sample included 301 respondents from the 50 states, the District of Columbia, local health organizations, and tribal health organizations. The unit of analysis for the sample was the organization, meaning that no more than one survey was sent to each organization. The sample frame was constructed from multiple sources and resulted in three separate lists for state, local, and tribal health organizations. A list of the 51 Directors of state health departments and the District of Columbia served as the primary contacts for the states. A list of approximately 2,700 members of the National Association of County and City Health Officials (NACCHO) served as the sample frame for the local health organizations, and tribal health organizations were selected from a list of approximately 400 tribal health organizations provided by the Indian Health Service (IHS). The 2005 User Assessment identified important differences among states, local, and tribal health organizations, as well as among organizations/agencies of various sizes in terms of their exposure to and use of the initiatives and the extent to which they found them to be relevant and effective. The results revealed that over 80 percent of responding state, local, and tribal health organizations were aware of Healthy People 2010, and more than 70 percent reported using it. States and localities said they use Healthy People 2010 to guide their research, outreach, and internal planning processes, and they typically found specific health objectives to be the most useful aspect of the initiative. In contrast, tribal health organizations were more likely to mention the participatory goal-setting process of Healthy People 2010 as its most useful aspect. Tribal health organizations and small state, local, and tribal health organizations were also less aware of Healthy People 2010 than larger organizations. The variation in these results was consistent with studies that have shown marked differences in localities’ readiness to meet specific Healthy People 2010 objectives (Kanarek & Biala, 2003). Since the 2005 User Assessment, HHS has undertaken a number of efforts to increase awareness of the Healthy People initiative among certain stakeholder groups. For example, ODPHP worked with Regional Health Administrators and State Healthy People Coordinators to conduct targeted outreach to local and tribal health organizations to increase their knowledge and use of the initiative. Other HHS and non-federal partners have also disseminated program and implementation tools such as Healthy Youth (Kanarek & Biala, 2003), Rural Healthy People 2010 (Gamm & Hutchinson, 2004), and models for state-based Healthy People initiatives (State Healthy People Plans, 2008). These efforts demonstrated the need for a follow-up study to the 2005 User Assessment to assess awareness and uses of Healthy People 2010 among state, local, and tribal organizations/agencies. Offer insight to assist HHS in preparing the next generation of national health objectives, Healthy People 2020. The 2008 User Study also provides data in support of ODPHP’s annual Program Assessment measure: the percentage of states that use the national objectives in their health planning processes. In 2005 and 2006, 96 percent of states reported using Healthy People 2010 objectives in their planning processes, representing an increase from the 2002 and 2004 usage rates of 45 and 65 percent, respectively. ODPHP’s 2007 target of having 96 percent of states use national objectives in their planning has already been achieved, but its 2008 target is set at 98 percent. The data collected in this study will help ODPHP to measure progress toward this goal.